Prime Minister Binyamin Netanyahu has a special opportunity to make peace with Israel’s enemies, and owes it to the nation to do so, Yonatan Ben-Artzi argued Saturday night at a memorial for slain Prime Minister Yitzchak Rabin. Ben-Artzi is Rabin’s grandson. He spoke at a rally in Rabin Square, in Tel Aviv. In his speech, Ben-Artzi heavily hinted that Netanyahu bore some responsibility for Rabin’s 1995 assassination, and condemned the Israeli right of the time for, he charged, encouraging the murder. “I have no intention of holding you to account today for what happened that night,” Ben-Artzi said, addressing Netanyahu. “That is not my intention… My pain is still here, but I’m not here to blame you for what happened. “Every one of us did their own personal reckoning, and I’m sure that you, too, learned and internalized a lesson about the boundaries of political discourse,” he continued. “Prime Minister Netanyahu – my grandfather was murdered for peace, and you owe us – all of us – peace,” he declared. “Sir, you have a unique opportunity to give us peace. For the first time in years, you have a unique opportunity to take advantage of a unique situation in the world, and to make peace and bring a solution, simultaneously, vis-à-vis Iran and the Palestinians, all in the same framework, with the support and encouragement of the entire world,” he argued. He then moved on to condemning incitement prior to the assassination. “We will not forget or forgive the wild, violent incitement that took over in 1995. We will not forget or forgive the violent riots, the burning tires, the signs, the calls of ‘traitor,’ ‘murderer’ and ‘liar’ aimed at a Prime Minister, a hero of Israel,” he declared. “We will remember those pathetic people who called to the mob to take the law into their own hands, and oust the ‘government of blood’… We will remember the group that put the gun into [the assassin’s] hands, opened the door for him… and allowed one despicable murderer to rise up against our democracy,” he charged. Some on the Israeli right spoke out against the Saturday night memorial event, which is expected to be the first of several memorial ceremonies held this week. 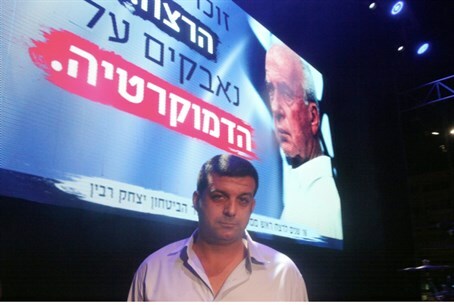 “I wasn’t at the rally in Rabin Square. Because the political left’s incitement, even if it is fading, does not need to be given legitimacy,” declared former MK Michael Ben-Ari. Minister Naftali Bennett, too, cautioned against linking mourning for Rabin's assassination to a particular political path. "It is OK to denounce the assassination of Rabin, and yet disagree with the political path that he led," Bennett said in a statement Saturday night.